Comfortable audio is just a step away, with the Sony MDR-J10 headphones. The vertical in-the-ear design makes it really easy to wear these Sony headphones for prolonged periods of time. You need not worry about these Sony headphones clip-on headphones slipping off your head or ears thanks to their non-slip design, so jog away to the beats. Also, you can hear ambient sound through these Sony headphones which means that you will never be a hindrance to that vehicle honking for you to get out of the way. 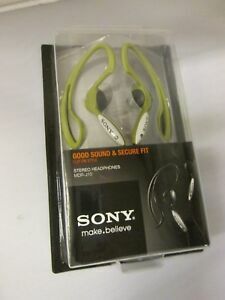 These green clip-on headphones feature a tangle-free cord for easy storage and quick retrieval. With all these features, you can spend hours listening to music through the Sony MDR-J10.